The Pune victory came off a superb performance by their bowlers which was later complemented by their top-rung batsmen to overhaul the meagre 74-run target set by a hapless Punjab. Pune now have 18 points in 14 matches and are at the second spot. They displaced Kolkata Knight Riders (KKR), who slipped to the fourth spot with 16 points. Mumbai Indians sit atop the table with 20 points and Sunrisers Hyderabad are at third spot with 17 points. Chasing 73 posted by Punjab, openers Ajinkya Rahane (34 not out) and Rahul Tripathi (28) forged a 41-run partnership before the latter was dismissed by spinner Axar Patel. Tripathi's 20-ball knock was laced with four boundaries and one six. 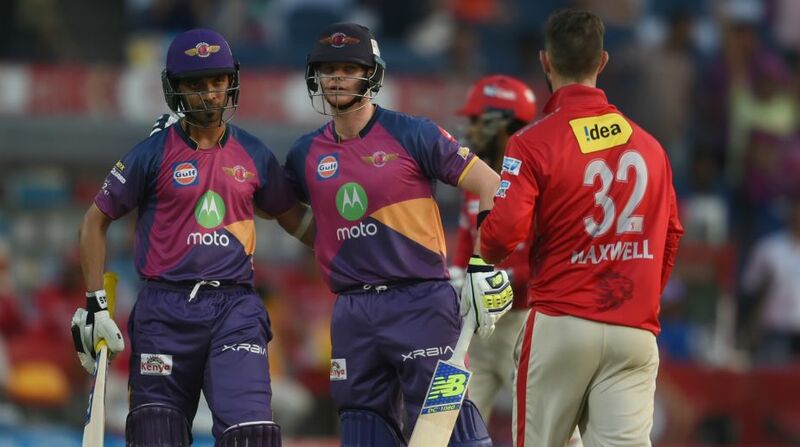 Unfazed, skipper Steven Smith (15 not out) and Rahane then completed the formalities without any hiccups for Pune to overhaul the Punjab score in 12 overs. Earlier, Riding on some disciplined bowling, Pune restricted Punjab to 73 runs. Axar Patel (22) and Wriddhiman Saha (13) were the major contributors for Punjab's cause. Punjab never looked in contention as they started their innings on a poor note. Martin Guptill (0) was dismissed by Jaydev Unadkat on the very first ball of the innings caught at short cover by Manoj Tiwary. After adding 19 runs to the score with Saha, incoming batsman Shaun Marsh (10) was also dismissed by Daniel Christian in the fourth over and the scoreboard read 19/2. Punjab's middle-order suffered a collapse with Eoin Morgan (4), who was playing in place of Manan Vohra, Rahul Tewatia (4) and skipper Glenn Maxwell (0) failing to step up to the occasion. They were all sent packing before seven overs had been bowled. Saha, who seemed good at the crease, could not handle the pressure and was dismissed by Christian in the 10th over. Axar Patel, however, showed his temperament and slammed a few boundaries before he was dismissed by Christian in the 12th over. Lower-order batsmen Swapnil Singh (10), Mohit Sharma (6) and Ishant Sharma (0) were also dismissed in the next three overs to restrict Punjab for 73 runs in 15.5 overs. For Pune, Shardul Thakur scalped three wickets while Unadkat, Adam Zampa and Christian took two wickets each.